Parties are great be it a formal dinner party with your family or a vintage tea party with your friends. To come together with food, music, and laughter is one of the most treasured memories you can savor forever; and what can really amplify the experience is appropriate setting. 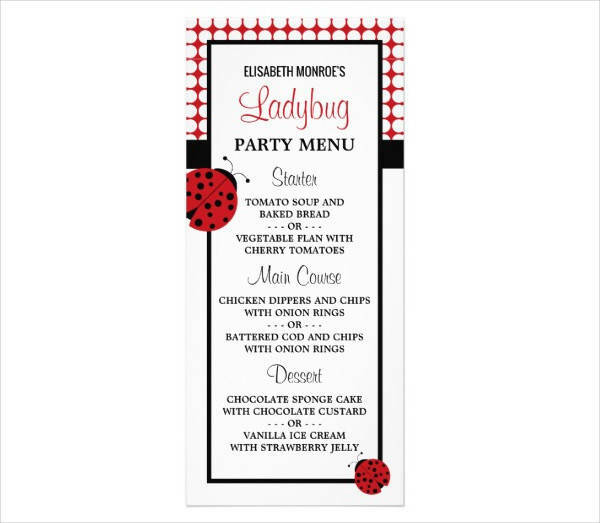 If you haven’t considered adding party menus to your list of party essentials, then you definitely need to now. When given the right amount of treatment in preparation, they can surely boost the energy of your party to a whole new level. 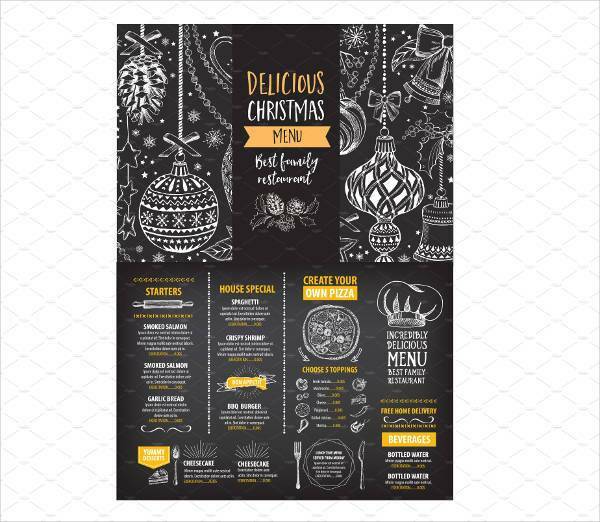 Take a look at these party menu designs we’ve got lined up for you to grab inspiration from. One of the most overlooked party prop is the party menu. 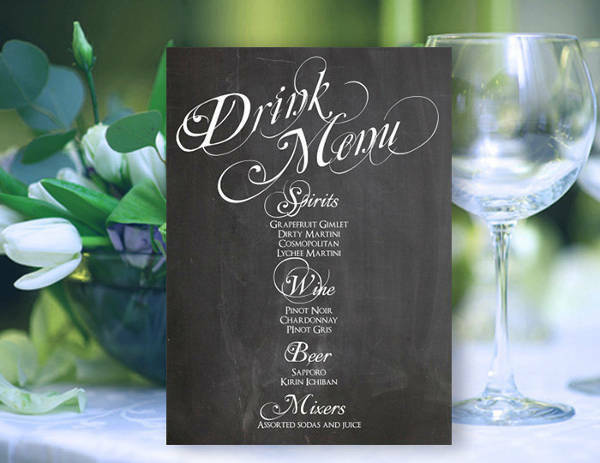 Party menus are often discarded as simple pieces of cardboard with a simple list of food and beverages. What most people don’t consider is the entertainment and aesthetic value they immediately add to the scene. Whether it’s a themed dinner party or a simple brunch, party menus can add to the artistry incorporated in the whole setup of the venue. They are created with intent and are wrapped in fine detail and design to unconsciously let you know you’re in an awesome party. The care and dedication given to describe the food and drinks are intended to amplify the anticipation for your meal, making the act of dining an overall heavenly experience. 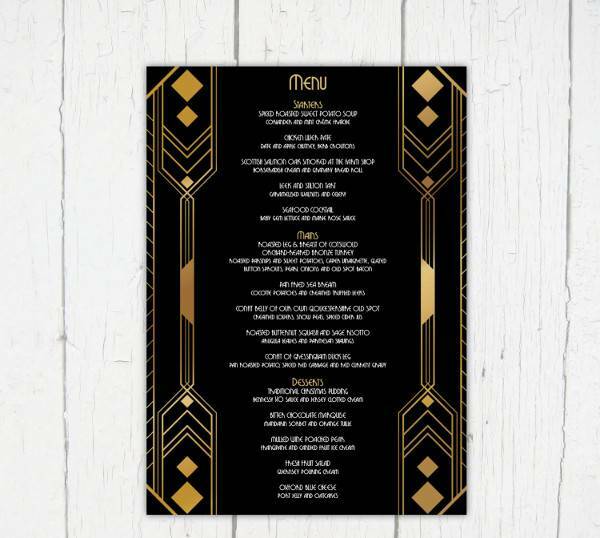 There’s no need to worry about making your party menus grand and super fancy. 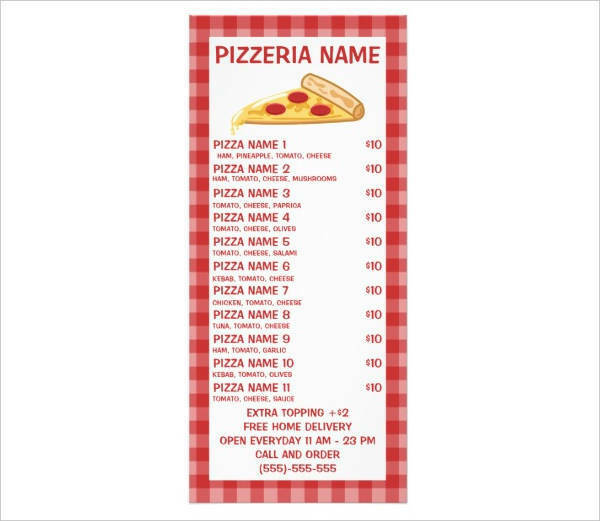 They simply have to be an extension of your theme or party concept. 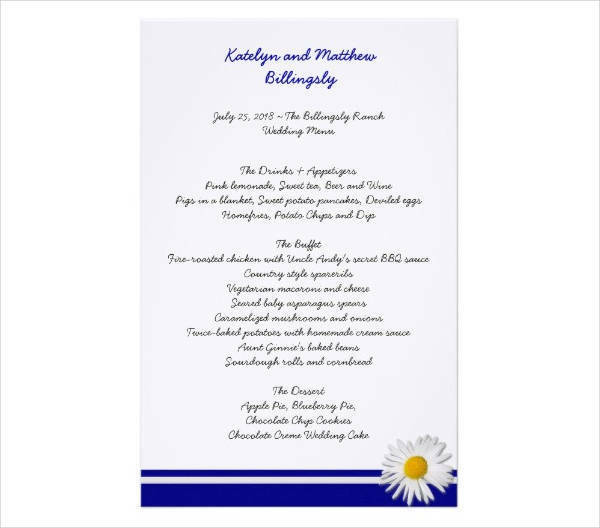 This means that your designs and concepts should be harmonious to that of your invites, setup, or other paraphernalia. 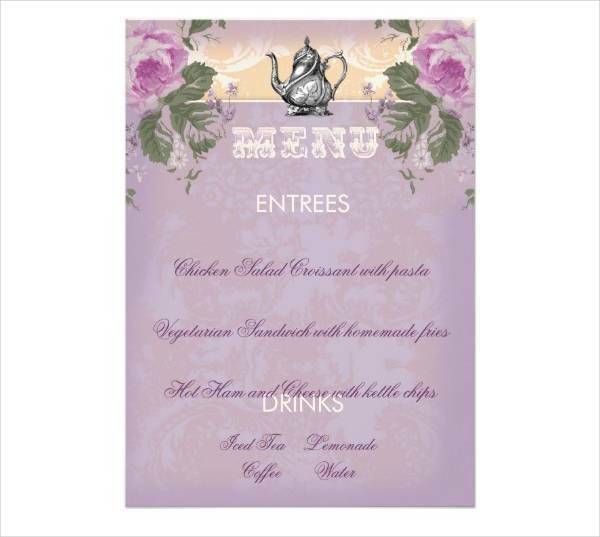 Party menus for a formal setting are usually similar to that of restaurant menus in both content and design. For content, they usually contain complete courses with appetizers or starters, main dishes and desserts. The number of options for your starters and desserts is entirely up to you. 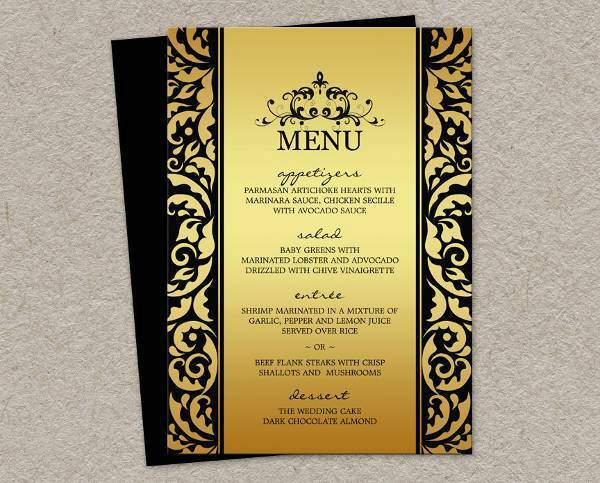 Design layouts for formal party menus are often sleek and minimalist. Some would opt for a delicate yet eye-catching font with little to no borders or background images. This is to emphasize the meals and make sure that’s where the attention of the reader stays. Unlike formal dinner parties where everything is organized and neatly put together, cocktail parties are the perfect avenue to let loose. They mostly consist of drinks and light conversation, thus their party menus should be just as unpredictable. There’s not much trouble in making a list of drinks and few side dishes for a cocktail party menu. The challenge lies in giving your menu spark and personality. They have to be light but engaging; fun but not too loud. 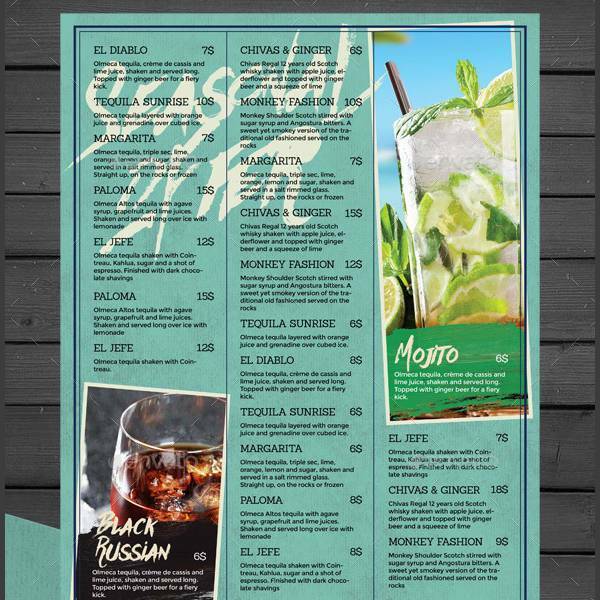 Cocktail party menus can be creative with their font usage and background colors. You can go for light and feminine, or neutral with striking accents. 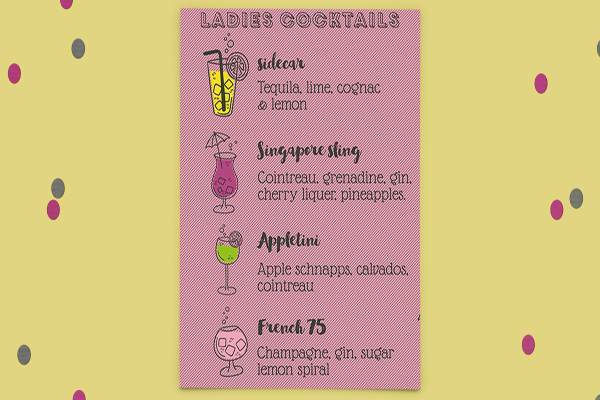 You can also include photos or quirky illustrations of the cocktails available to keep the atmosphere light. If you’re up for something playful and spontaneous, adding themes to your parties are always fun to try. They are also extremely entertaining when incorporated in party menus. 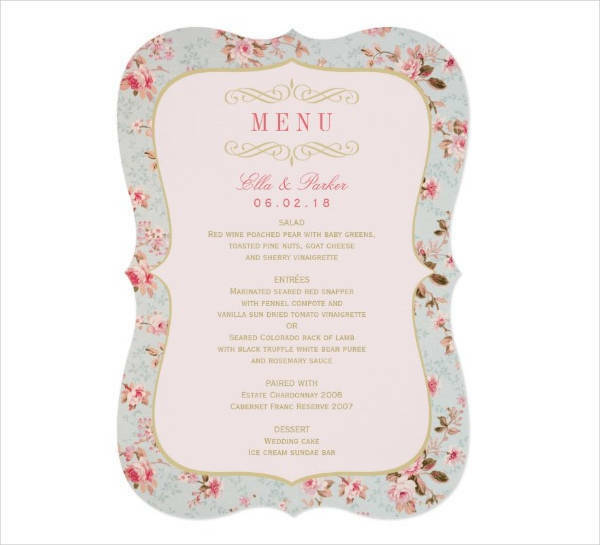 Party menus with vintage and floral designs look like a love letter from a cafe in the 1920’s. Keep it old-fashioned and sweet with handwritten text on special paper. 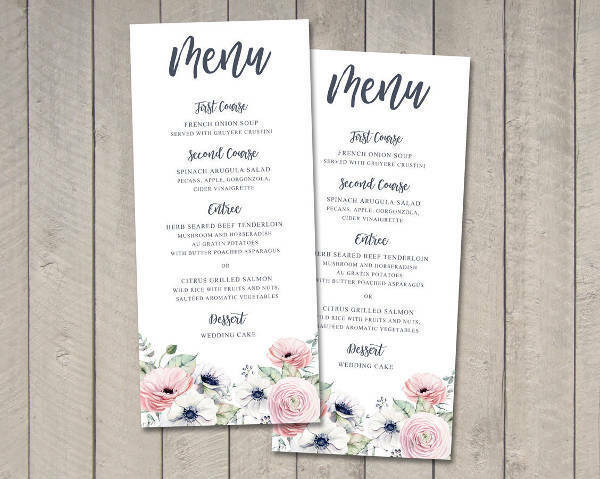 Border your menu with floral patterns that look a bit worse for wear to add to the effect. Holidays parties are not uncommon. In fact, there’s almost always a party to fit every holiday. 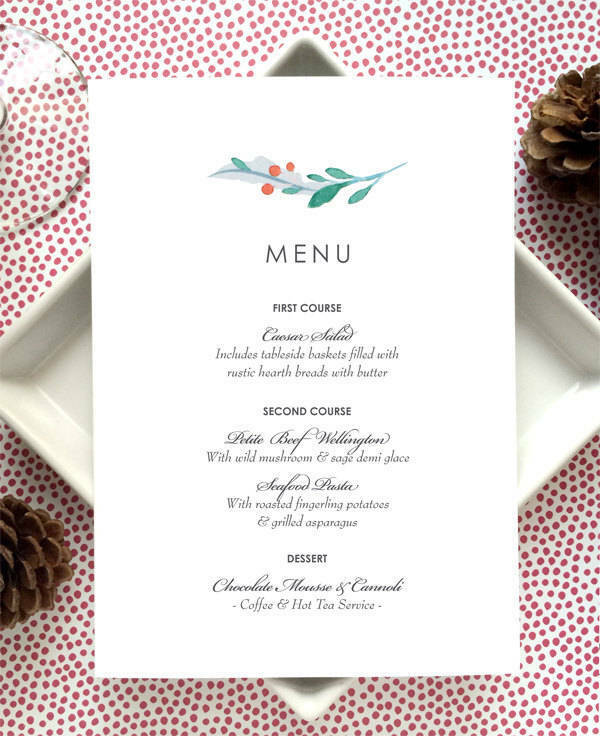 Boost the holiday spirit with party menus that are just as joyful and exciting as the celebration. 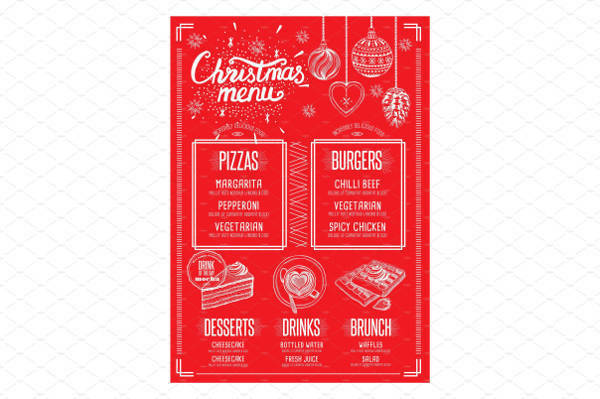 Christmas party menus can be presented in numerous ways. 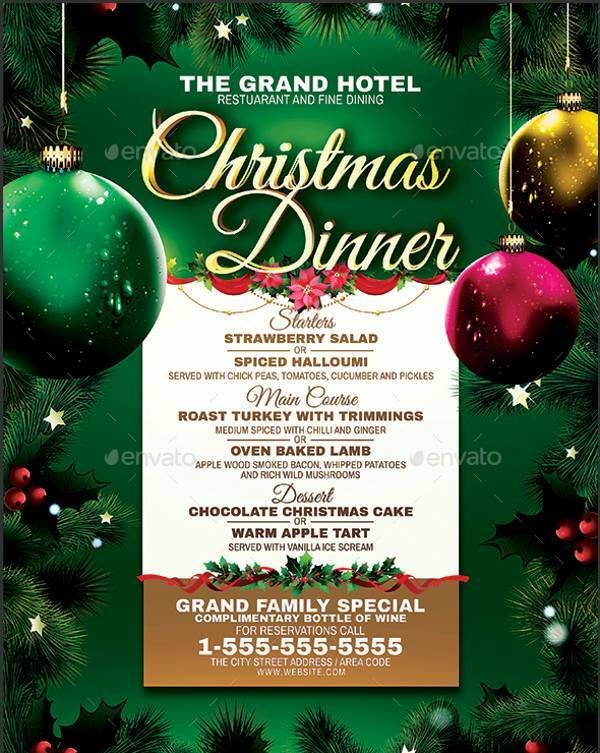 With so many Christmas ornaments and characters, you can choose even just a few to light up your menus. You can make Santa’s Naughty or Nice list with desserts under Nice and drinks under Naughty. 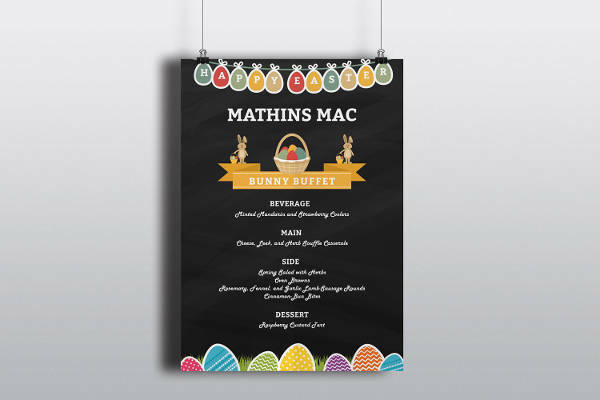 The meals prepared for Easter can be placed in colorful Easter eggs on your party menu, with the famous Easter bunny at one corner of the page. These are usually in pastel colors for a light and fresh finish. A BBQ party menu can be as casual as a picnic. BBQ parties are the perfect Sunday chill pill where everyone just relaxes in the backyard or at a park. 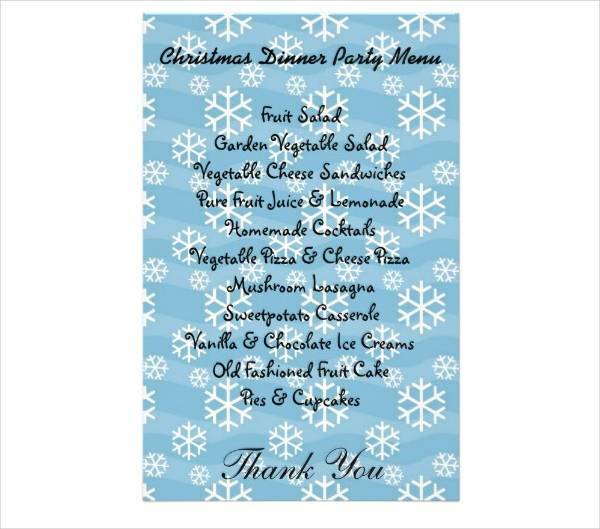 Their party menus are the same: laid-back and simple. 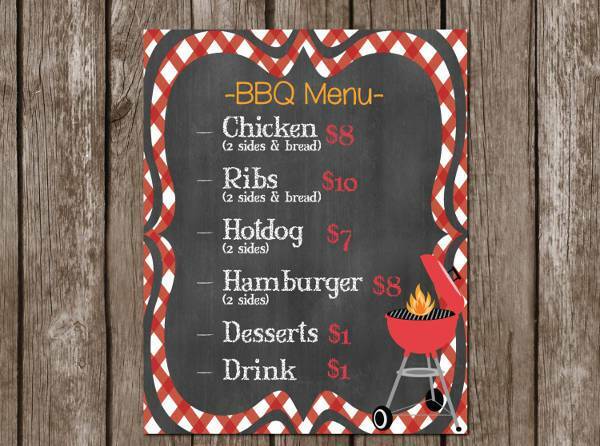 Make your party menus for a BBQ look old-school and chill with a simple chalkboard writing. Add in a few colors and illustrations that look like they were made by hand, and voila! your very own BBQ party menu! Everyone loves a good pizza party. 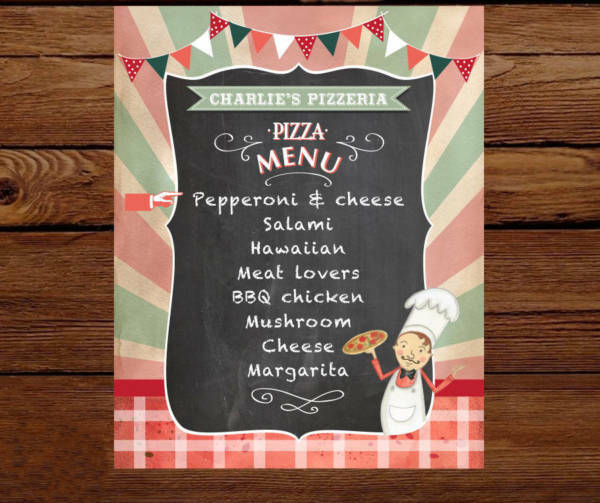 You almost don’t need a menu to have people come and eat with you; but if you want your party be 100 times better filled with all-around good fun, then a pizza party menu is worth the try. Play around with 50’s diner colors to make your menu look cool retro-style. You can feature different flavors using photos with a short description in a size that’s not too distracting. 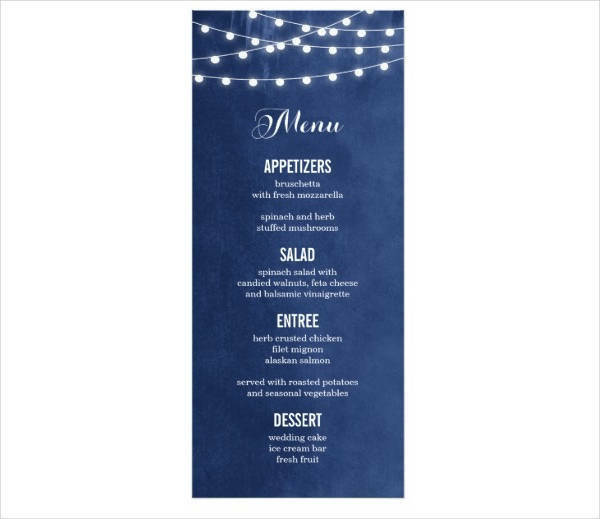 Party menus are a great addition to any and every party, of course, but the best time to show them off are at large gatherings. 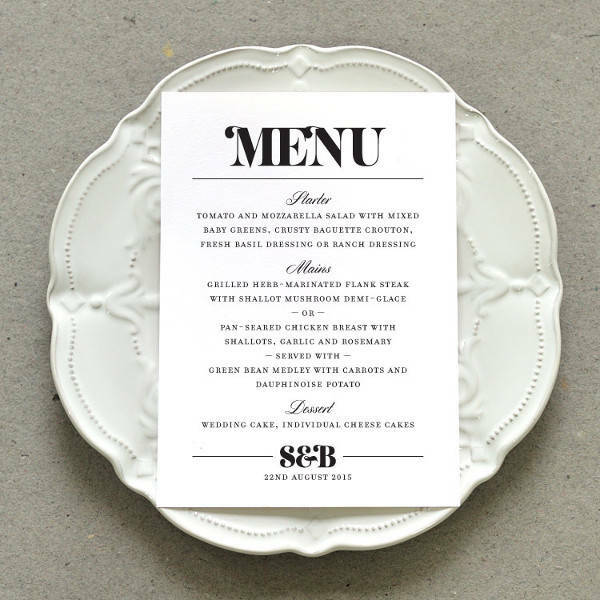 When you can’t attend to each and every guest, let the party menus speak on your behalf. They contain a message of soulful dedication to providing a warm and inviting environment for the people in attendance. 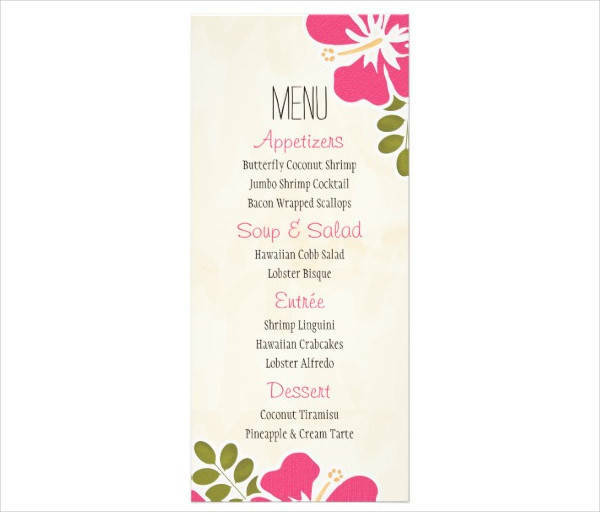 Party menus are a clear manifestation of the hard work and meticulous organizing skills you put into the event. 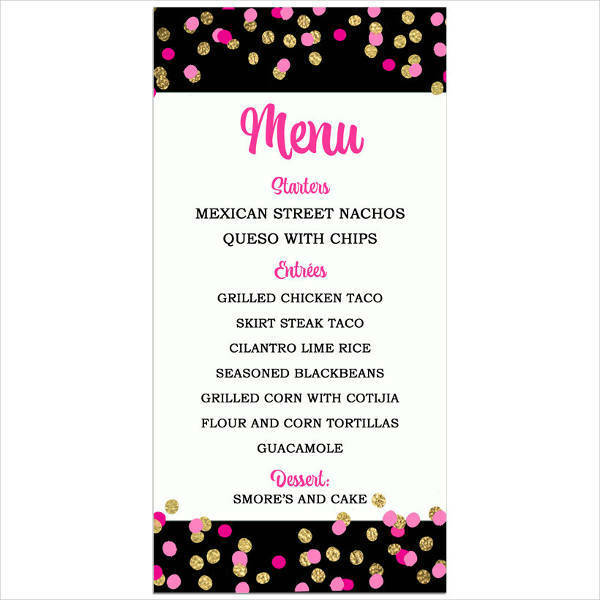 Party menus are also necessary for served meals. When there’s no buffet to feast over with the eyes, party menus give room for the guest’s imagination and anticipation. For events like weddings, dinner parties, and charity balls, there is a fixed dining area to accommodate the guests. Displaying the party menus on every seat at the table would be the appropriate choice. For cocktail parties and casual events that take place in areas like clubs, beaches, or a townhouse, the party menus can be placed by the bar or in a basket with art deco flowers. This all depends on the motif of your event, but they are usually clumped together in a creative manner when there are no set tables for dining. You need to finalize the actual food menu that goes in it. You also need to know for sure how many guests you want to attend your party. This enables you to have an estimate for your orders. If you happen to be the cook or have a kitchen staff, you now have an idea of the bulk of ingredients you’ll need. Once you’ve got all those out of the way, you can direct all your creative energy on the making and designing of your party menu. 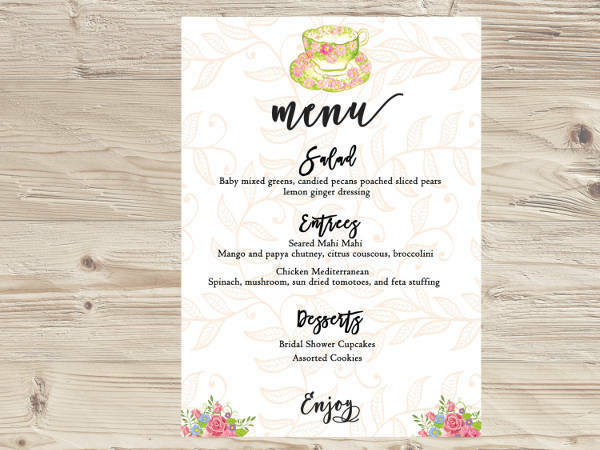 Party menu planning can be tedious work, yes, but our list of designs are proof of the immeasurable value the end product will have. It’s still fun and fulfilling work. That’s for sure. If you’re still on the planning process and have fallen in love with some of the designs shown above, don’t hesitate to download and see which one of them works for you and your upcoming party!